...He took his first win aged 19 in 2004 and remains the youngest driver to win a race. 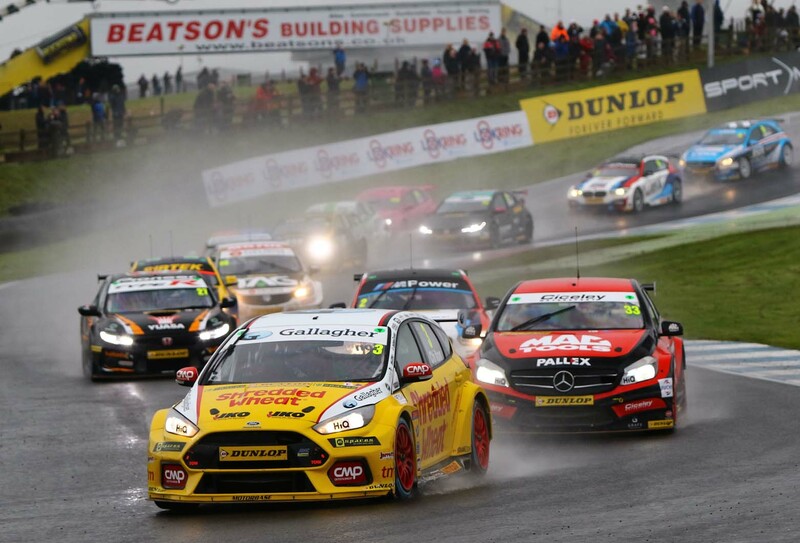 British Touring Car Championship races are short, intense affairs, around 30 minutes of bumper bashing and battling. Still, even with three of them in a day, such short races might not seem much of an endurance challenge for a driver. Yet the reality is somewhat different. Those three races are packed into around six hours. Add in the attention, scrutiny and pressure that come with being part of Britain’s biggest motorsport championship and race day becomes a non-stop, pressure-filled marathon for the drivers, with little time to rest. Tom Chilton knows that well. The 33-year-old has been racing in top-line touring cars since making his BTCC debut back in 2002. Ten years later, in 2012, he switched to the World Touring Car Championship. Last year, he competed full-time in both series. 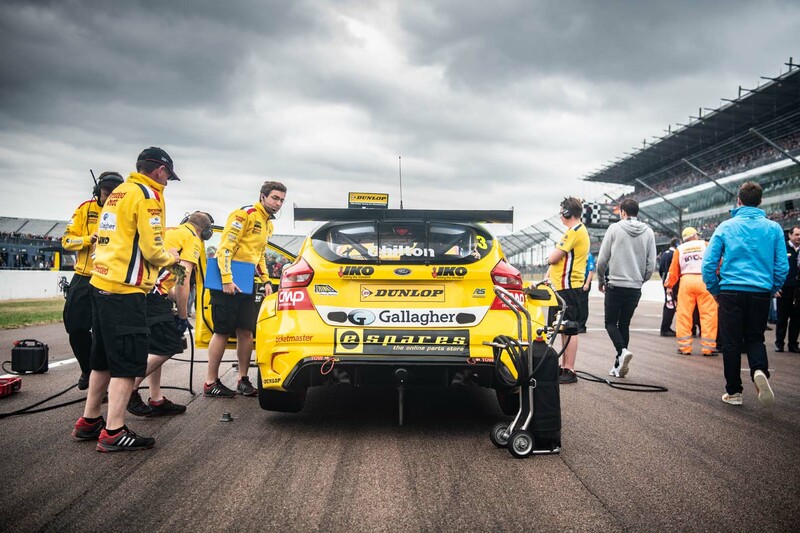 This year, Chilton’s full-time attention is on the BTCC, driving a Ford Focus RS for the Motorbase squad – or Team Shredded Wheat Racing with Gallagher, to use its official, sponsor-friendly title. 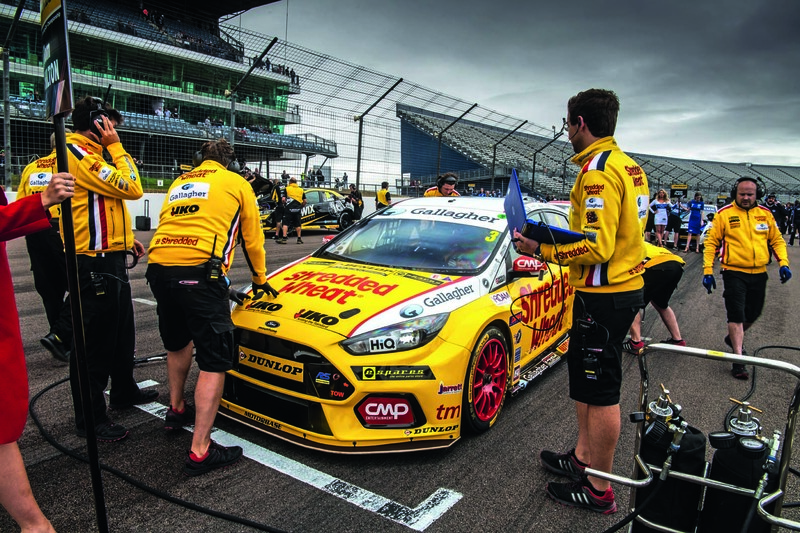 Autocar shadowed Chilton on race day of the BTCC event at Rockingham last month to find out exactly what a tin-top driver gets up to. Chilton arrives at Rockingham nearly four hours ahead of the first race, with a busy schedule ahead of him. First stop is the Motorbase hospitality unit, where boss David Bartrum leads a team meeting. Bartrum’s motivational speeches are, Chilton reckons, a highlight of the weekend. Today’s is delivered in the style of an ebullient American preacher. “Some teams are quite strict, but Motorbase make it all very enjoyable,” says Chilton. That family atmosphere is clear when you spend any time with the team – although things get determinedly serious once the racing begins. It’s off to championship organiser TOCA’s hospitality unit for Chilton’s first official act of the day: a breathalyser test. Every driver must take one on each morning of a race weekend, just to prove they’re absolutely fit to race. Chilton passes – several times, in fact, since photographer Olgun makes him redo the test again and again to capture the perfect photo. Chilton then heads to a small rest area in the Motorbase truck parked behind the pits to get changed into his race overalls. He shares the space with team-mates James Cole and Sam Tordoff – the latter trying to catch up on his sleep when Chilton arrives with journalist and snapper on tow. While some drivers change back into their civvies between races, Chilton prefers to keep his overalls on all day – although he admits they’ll likely smell “hideous” by the end of it. It’s breakfast time. 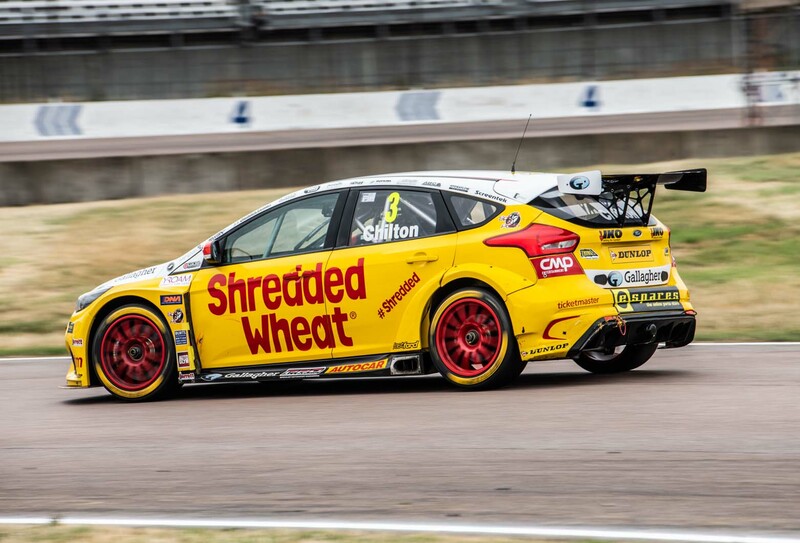 Not for Chilton, though: instead, he and Cole are offering free sponsor’s cereal to arriving spectators on a Shredded Wheat promo stand in the shadow of Rockingham’s main grandstand, past which spectators are trickling into the circuit. 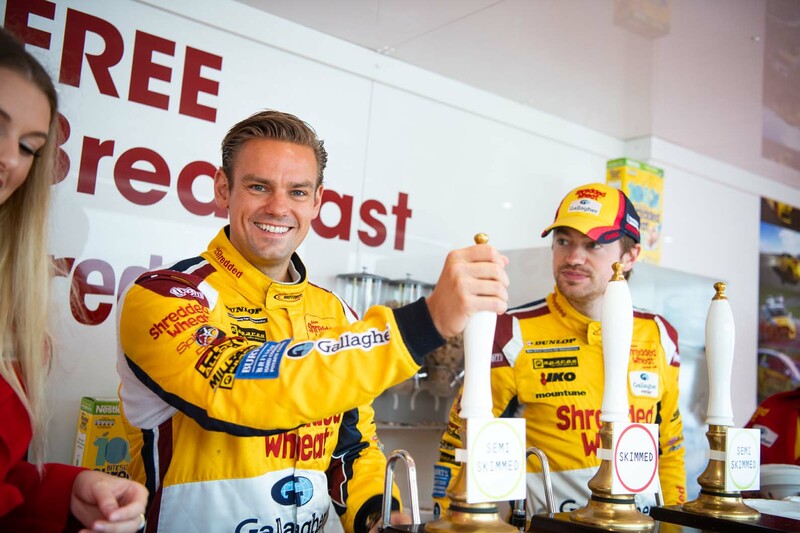 The ‘Breakfast Club’ stand includes a small bar, behind which Chilton and Cole stand, shovelling bite-size biscuits of 100% whole grain wheat into bowls, adding milk from a bar pump. There’s limited demand for cereal, partly because there are relatively few spectators at the Northamptonshire track today – a symptom of the poor weather forecast and the circuit’s uncertain future – and partly because the fans seem more tempted by the burger van next door, which has a huge queue. 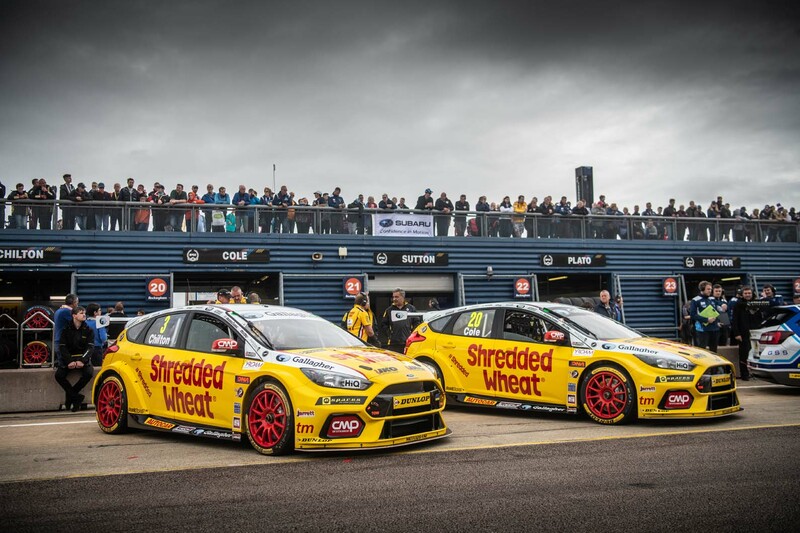 At the Brands Hatch season opener, the team dished out more than 1000 bowls of cereal. It’s impressive stuff to watch while munching on my cereal (original, skimmed): I’ve seen many drivers go through the motions at sponsor events, but Chilton is a bundle of energy throughout. From there, it’s back to the paddock and finally time to sit down with car chief Nick Silvester to discuss set-up and strategy for the event. Showers are forecast for the day, so much of the chat will be about what set-ups to adopt in differing conditions. Rockingham has an ultra-wide pit lane, and ahead of each BTCC race the cars are brought out of the garages and lined up in the outer pits. While his mechanics negotiate his bright yellow Focus RS into position, Chilton readies himself, pulling on his helmet and race gloves. “Just focusing, mate,” he smiles, still ultra-friendly but now clearly with his mind focused on the task in hand. He has qualified a strong seventh for race one and, once he’s driven his Focus onto the grid, he remains cocooned in it, working out his plan for the first corner and beyond. 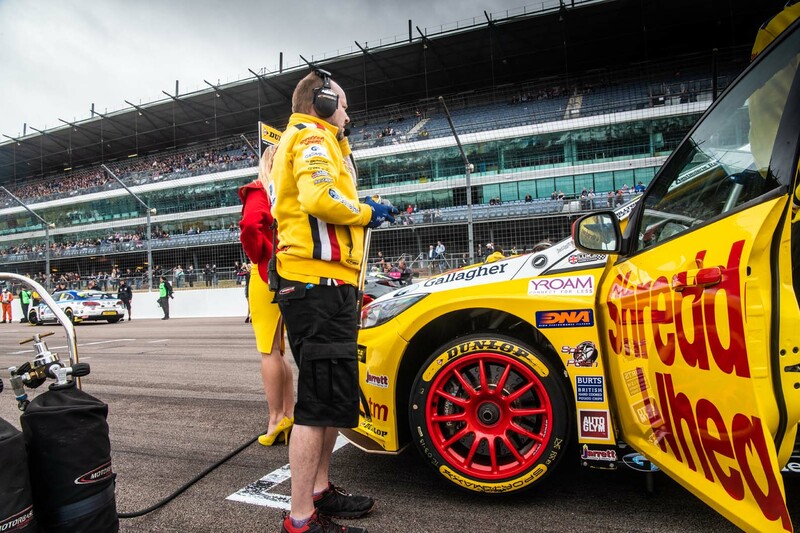 The Rockingham circuit is a recipe for first-lap drama. Cars blast around the banked first turn and down a long straight before braking heavily into a tight hairpin. Sure enough, there’s a big pile-up at the hairpin on lap one, but Chilton deftly dodges the mayhem and emerges second, behind the Mercedes of Adam Morgan. To add to the drama, it starts to spot with rain. 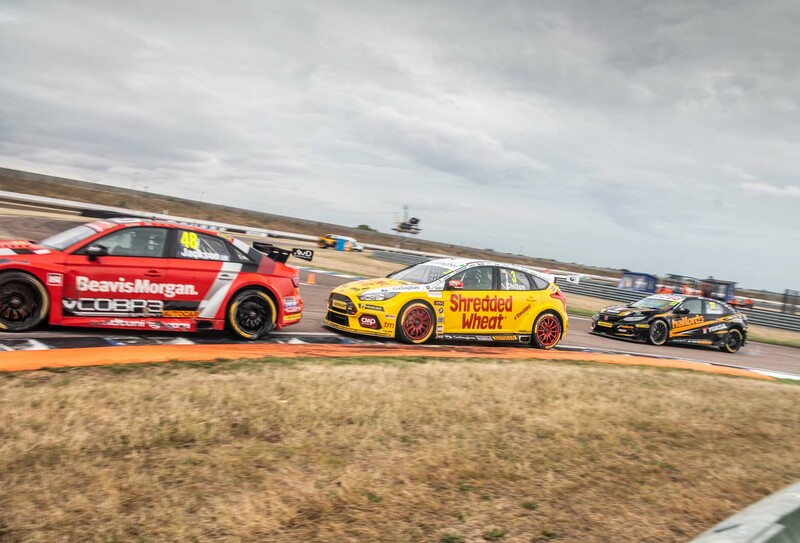 After a safety car period, Chilton tries to attack Morgan but is soon focused on fending off the Subaru Levorg of reigning champion Ashley Sutton. The two make contact at one point, which damages one of Chilton’s tyres. Back in the Motorbase pits, the team, along with a host of guests, watch the action unfold on television. Rockingham has one long pit building, with thin internal dividers between individual garages. Sutton’s BMR squad is right next door, so when he finally fights his way past Chilton, the cheering from the other side of the divider contrasts sharply with the deflation in the Motorbase camp. Still, Chilton manages to hang on to third place, a result greeted with relief as much as celebration. There are around two hours between the end of the first race and the start of the second, but there’s precious little time for Chilton to have a relaxing lunch – especially since he’s got to do a post-race interview and appear on the podium. From there, it’s straight to the pit lane for the autograph session. It’s now properly raining, but Chilton sits and signs for 30 minutes or so, shielded by umbrellas held up by Motorbase’s promotional girls. Just before 1pm, Chilton heads to the Motorbase unit for a working lunch. While eating, he chats to his friends and family – his girlfriend is here, although his two kids are still too young to attend a race day. Then it’s time for a Q&A session for the team’s 80 or so sponsor guests, including representatives from Shredded Wheat and GardX. Chilton is again on great form, giving a detailed, engaging recap of the first race. That sponsor-friendly approach has been drummed into Chilton since he started competing in the T-Cars junior series at the age of 14. “I had lessons in articulation and media presentation before I ever raced,” he says, although it didn’t always go to plan. As soon as the Q&A has finished, it’s time for Chilton and his engineers to focus on the second race, particularly as the heavy rain shower, since passed, has left the track damp but slowly drying, making set-up something of a gamble. “Ballsy call here. We’re going for it,” says Chilton, as his car is wheeled into the still-damp pit lane on slick tyres ahead of race two. As the cars depart the pit, there’s a real mix of slick and wet tyres, but on the way to the grid it’s clear slicks are the way to go, so most crews switch. Once again, there’s first-turn drama: this time Chilton is delayed by it and falls to seventh. He’s also gone the wrong way on set-up and, laden by success ballast after race one, slips back to tenth. The two hours between the second and third races are a little quieter, giving Chilton time to rest a bit and work with his engineers. That’s particularly important since Chilton’s had some good luck: he’s drawn on pole for the reverse grid final race. It’s damp but drying again for race three, but slicks are clearly the way to go – and for Chilton that means running the BTCC’s hard ‘option’ tyre, which drivers must use in one race each weekend. The harder tyre has less grip, so Chilton has to judge how much earlier he needs to brake into the hairpin. He hits the pedal about nine metres earlier than previously, but not soon enough. “I thought it was under control but the car suddenly snapped and ran wide,” he says. There’s plenty of run-off and Chilton might have got away with it had several of his rivals not made the same mistake. Matt Simpson’s Honda Civic slides into the side of Chilton, damaging the Focus’s suspension. His race is over. It’s a low end to a day that started so promisingly. 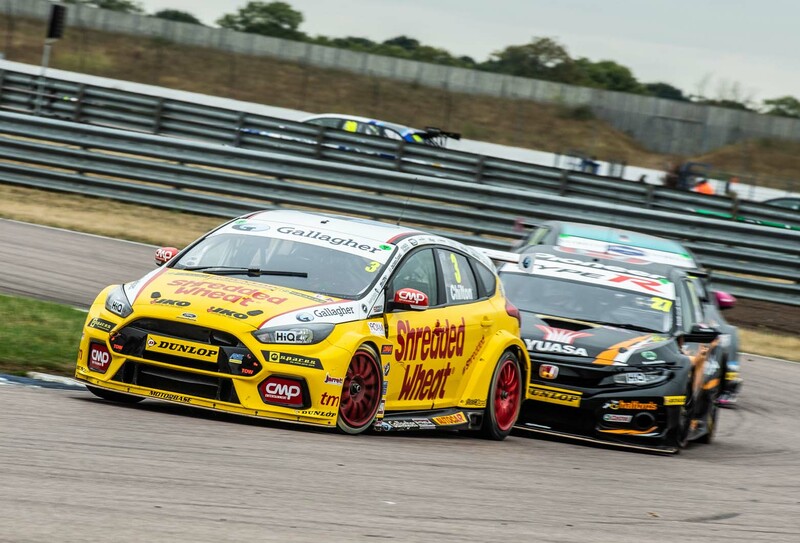 Two weeks after Rockingham, Tom Chilton was back in BTCC action at Knockhill in Scotland. After battling through two tough races, he once again lucked into pole for race three. This time things went a lot better. Chilton judged the wet conditions perfectly and secured his first BTCC win since the 2011 season. Chilton heads to this weekend’s finale at Brands Hatch with an outside chance of claiming the BTCC title.